Rev. 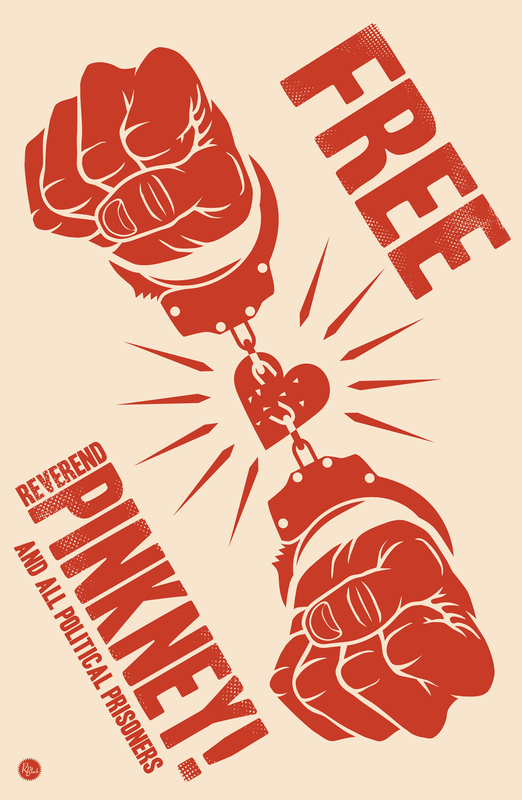 Pinkney takes the stand on Tues. and Wed. of the coming week (3/21, 3/22). The trial will begin this week on Tues. and last until Wed. or Thurs. Last week was the first week of the trial. The judge showed very obvious and almost extreme partiality towards the prosecution. "It's as if he's one of the prosecutors", said Rev. Pinkney. Another striking thing was how the prosecution's witnesses lacked credibility. One Benton Harbor woman commented at the end of one of the days, "In Benton Harbor people are now afraid that if they vote, police will come to their house." 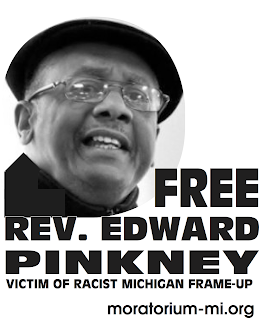 Benton Harbor community leader Reverend Edward Pinkney went on trial this past Wednesday on charges of electoral fraud. If convicted he could face 20 years in prison. Last Saturday there was a rally in Benton Harbor organized by BANCO (Black Autonomy Network Community Organization), the community group led by Rev. Pinkney. I would estimate that between 100 and 150 people attended. A whole busload of folks came down from Detroit, as well as smaller contingents from all over Michigan and some folks from Chicago. Among the speakers were Rev. Pinkney himself, General Baker, Marian Kramer, Maureen Taylor, and the head of a network of Black nationalist radio stations headquartered in Washington, DC (I don't recall his name off the top of my head). The crowd was roughly 75% Black, 20% white and 5% Latino. The rally was followed by a spirited march around the Benton Harbor police station. Though only a small handful of Benton Harborites attended the rally itself we got a lot of horn honks and sympathetic folks observing the march from their front yard. 6 witnesses for the defense backed out near the last minute, apparently due to police harrassment. It seems like it's a fairly regular practice for police to pay visits to local supporters of Reverend Pinkney warning them that it's a bad idea to associate with him. In any event, the defense still has 17 witnesses lined up. I attended the first day of the trial on Wednesday. There are 8 white men, 4 white women and 2 Black women on the jury, which Rev. Pinkney's wife Dorothy told me was a victory; apparently they were expecting an all white jury. Of the 4 witnesses testifying on Wednesday for the prosecution, one did not say anything particularly damning from what I could tell, 2 had drug problems and the other, a woman from Kalamazoo, registered to vote in the Benton Harbor recall election under the false pretense that she'd be moving there within 30 days of the election. It seems that most of the prosecution's witnesses have something to lose by not going along with the frameup against Pinkney. I called Rev. Pinkney last night for an update on the day's proceedings. The prosecution was still calling witnesses but it sounded like things had gone very well for the defense. One of the prosecution's witnesses apparently flip-flopped on the stand, coming out and saying that the police had forced him to present false testimony and threatened him with trouble if he didn't. Needless to say, this really shook the prosecution. Anyway, that's where things stand now. The trial will probably run at least until next Wednesday or Thursday. If anyone from Detroit, Ypsi/A2, Chicago, or anywhere else can take a day to go to the Berrien County courthouse in St. Joseph, MI to show your support, that would be very welcome. The trial completed its third day and is expected to go to jury on Tuesday. The government witnesses have been discredited. Although the state needs very little to convict anyone, the defense is thinking positive that the truth will win out. The witnesses have some history with drugs, arrests, the police or prison and were obviously threatened into testifying; a sad glimpse of how the state uses the poor to fight the poor to maintain the wealth and power of the corporations/privileged few. The Judge is preventing the defense from bringing the drug background to the jury. At one point the lawyer was threatened with criminal charges for bringing out the drug history of a witness. The City Clerk testified. The prosecution tried to make it seem that there was some kind of conspiracy between PInkney and the former clerk around absentee ballots but this didn't hold water. It is also worth noting that the state investigated the clerk following the recall, but found no grounds to charge her with anything. Yet she was fired from her job after the recall. She is suing the city in an upcoming trial to be held in Grand Rapids. Grassroots leaders from Benton Harbor, and other cities, are attending the trial. Everyone knows what's at stake. Whirlpool, Cornerstone, the local power structure -- the powers that be -- need a free hand to sell off the city and are stopping at nothing to guarantee their profits. The Defense Committee is asking people to write the Governor of Michigan to get the charges dropped. The governor already stated she can do nothing about local trials, but it's still good to have people act. The defense committee is asking for people to attend the trial on Tuesday.